Almost four years ago, I posted a comic laying out the Geohashing algorithm. The algorithm generated a set of random latitudes and longitudes each day, spread out across the globe so there was generally always one within a few dozen miles of every location. I figured they could be used for hiking destinations, sightseeing, meetups, or whatever else people came up with. I wanted to make an algorithm that anyone could implement, which didn’t rely on a central authority or ongoing support from any one maintainer. I also wanted to make it impossible to know the locations more than a day or so in advance, so that if geohashing became popular in an area, no one could publish a list of future locations that woud give property owners, park rangers, or local police time to prepare. So each day’s coordinates are randomized using the most recent Dow Jones opening price, which isn’t known until the morning of that day—or, in the case of weekends, a day or two in advance, which helps with planning larger weekend trips. In the days after I posted the comic, there was a flurry of geohashing activity, which quieted down as the initial novelty wore off. But it didn’t die, and for the past several years there’s been a small but vibrant community building around the Geohashing Wiki. There are numerous daily expeditions, and they’ve taken some beautiful pictures and come up with a lot of neat tools, games, and achievements. One of the many things they did was use a tweaked version of the algorithm to come up with a globalhash, a single coordinate for the day somewhere on the planet (biased toward the areas near the poles). They’re usually over the ocean, but a few of the land ones have been reached. Yesterday’s globalhash fell less than a kilometer from the South Pole. 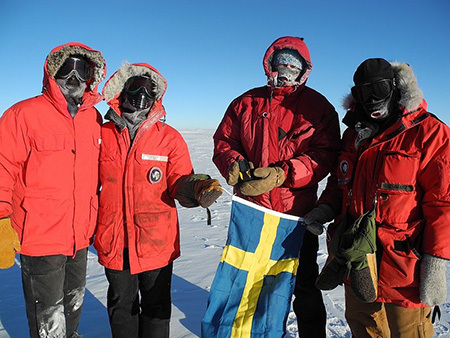 User Carl-Johan got in touch with the Scott-Amundsen research station, and later that day, the hash was reached by Katie Hess, Dale Mole, and Joselyn Fenstermacher of the US, Robert Schwarz of Germany, and Sven Lidström of Sweden. If you want to look up today’s geohash for your location, you can use this online tool, or one of the others listed on the Coordinate Calculators page. Hi dear , The first two individuals take the end and the third guy requires the center one. I have learned something about this topic. Excellent post. I was checking continuously this blog and I’m impressed! Very helpful information. found this web pge as a finest website for newest updates. It involved a grainy picture of a deliver in a Japanese individuals harbour plowing through an unimpressive-looking range of breakers. It is very informative for me and i gain a lot of information from it. Very nice share and thanks for shearing.